FAIRFIELD — On Palm Sunday, churchgoers celebrated Mass at Notre Dame, the emblematic cathedral in the heart of Paris. At around 6 p.m. the next day, the entire world watched helplessly as the cathedral was ravaged by flames. 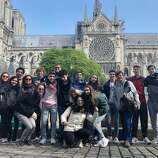 A group of Fairfield Warde High School students, in France until April 20 with French teachers Rabia Mairech and Steve Farkas as part of an exchange program, had just visited Notre Dame the day before, on April 14. Mairech said the school group was in the southern town of Nimes that evening after flying out from Paris Monday morning. Greenwich students from Stanwich School were also in the area that same Sunday. According to reports, the more than 800-year-old Paris cathedral is structurally sound, but with parts of its vaulted ceiling exposed to the elements. Hugues Seguinet, a 24-year-old Parisian law student at the Paris Institute of Political Studies, saw the smoke as he was driving home from school on Saint Germain Boulevard. From his home on street Monsieur-le-Prince, a mere 10-minute walk from the cathedral, Seguinet could see the column of smoke rising through the air. “It was kind of spectacular to see all the police cars and firemen trucks driving very fast along the Boulevard Saint Germain,” Seguinet said, referring to the fire as one of the most tragic things to happen in France in the last decade. 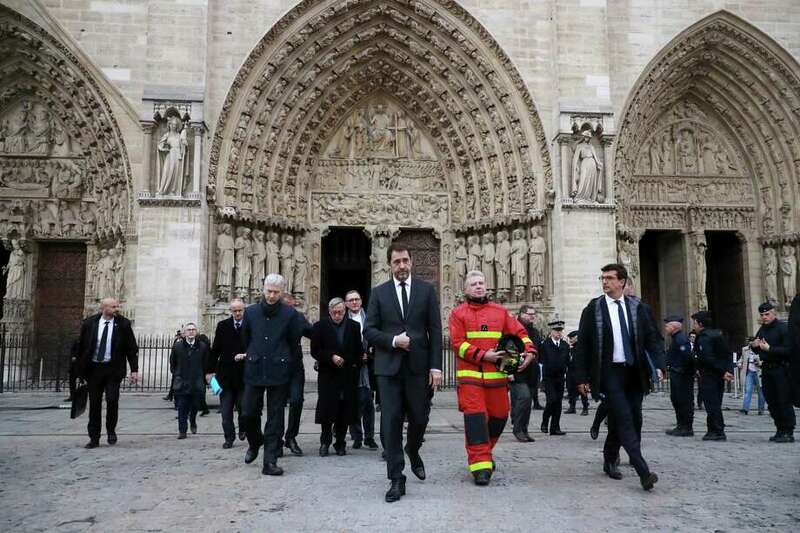 French President Emmanuel Macron vowed to rebuild Notre Dame and that an international fundraising campaign would be launched April 16. Back in Fairfield, French natives felt loss, but also hope in their hearts. Sylvie Lobsenz, president of Literakid, LLC, a language instruction company, was at a nail salon when her phone started blowing up with WhatsApp and Facebook messages from friends in Paris. When Lobsenz looked at the television, the images shocked her immediately. Lobsenz, a native of Perpignan, a city in southwest France, has lived in the United States for 25 years, most of that time in Connecticut. She visits her home country every summer and every trip includes a visit to Notre Dame. “Last time I visited, we went inside the tower and I remember looking from inside at where the bell is. You can see all the wooden structure,” Lobsenz said. Investigators in Paris are attempting to determine the cause of the fire. Artworks rescued from the fire will be transferred to the nearby Louvre Museum, reports say. Dorothee Ancel, a Parisian who has lived in Westport for 11 years, was home when she also received news from her friends back in Europe. Ancel, who was in France only last Christmas, recognized she may not live long enough to see Notre Dame rebuilt entirely, but said she’s looking forward to keeping a positive attitude. “My hope is that they can save what is left and rebuild something that can withstand anything, even a big fire, for the next 100 years,” Ancel said.